Step 1: Go to Menu and Click Students. Step 2: Now to add a new student click a “+” sign to add a new student. Step 3: After clicking “+” sign a new form including detail information of students will pop up, it will have two option to Add Single student and to Add Bulk Students. 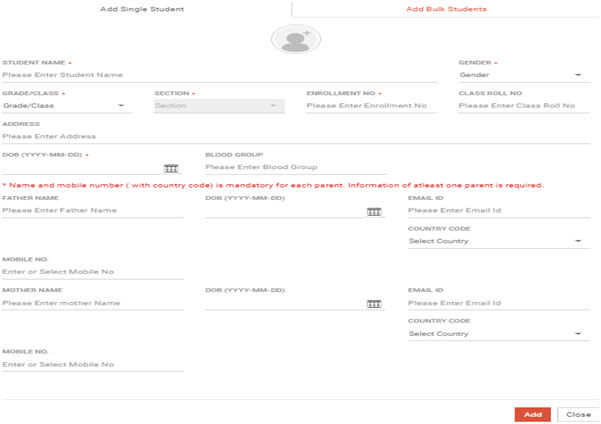 Step 4: On the Add Single Student tab, fill in the details like name, grade, section, enrollment, gender, enrollment , DOB, parents name, country code and mobile number. Step 5: Now Press “ADD” and the student will be added in your data.